Restaurants Brighton working in partnership with top restaurants bring you RB20, receive 20% off your food bill at featured venues. No sign-up, no fee, just great Brighton restaurant deals. Book with RB20 to revisit old favourites or discover new foodie destinations. Restaurants Brighton works in partnership with Sussex wide venues to bring you the RB20 rewards. There’s nothing to sign up to, and no fee, just great Brighton restaurants deals. 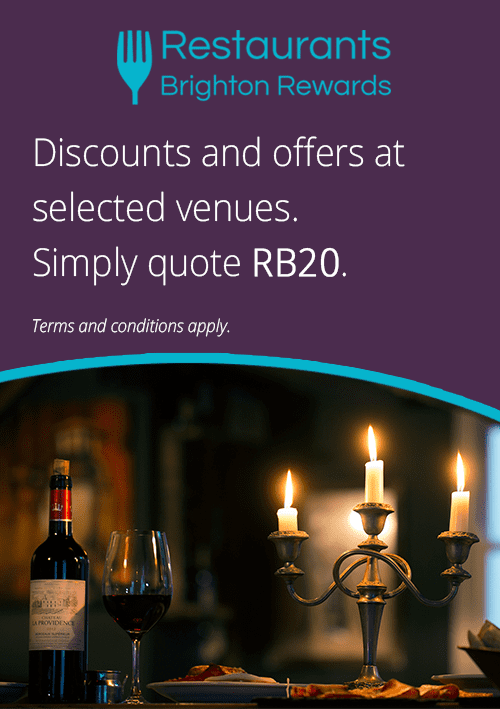 Receive 20% off your food, and in some cases, your drinks bill too, check out the featured venues for individual terms and conditions and make sure you book quoting RB20. Use these generous Brighton restaurant deals to revisit old favourites or discover great new venues. Treat your nearest and dearest and dine in style with restaurants featured on our Top 20, or grab your mates for some top pub grub. We’re helping you stretch your monthly paycheck in style with RB20’s fantastic Sussex and Brighton restaurant deals.